Ah, young love. The passion, the fire, the hordes of little notes that so many children need to make for every other little boy or girl in their class to stick in a shoebox covered in colored tissue or construction paper. Regardless of the reason, it is one of the few times of the year when even normally non-crafty parents have to come together with their children and try to wrangle a count of how many kids are in their class out of them. So whether you are trying to make a ton of valentines, a place to put a ton of valentines, a loving Valentine craft for your Mom and Dad, or a truly special Valentine for your crush or true love I think you'll find romantic ideas and craft inspiration right here and may your loving dreams come true. How to Make a Valentines Day Mailbox with Movable Flag Crafts Project - If you are in Elementary School, then you probably need to make a Valentine’s Day Card Holder for your Classroom friends to place their cards into. Well, today we will show you how to make this US Mailbox with moving Flag to bring to school with you to share the love with your friends. You can use this later on to Store your special letters and cards in. How to Make Valentine’s Day Suitcase Mailbox Craft Idea for Kids - Today we will show you how to make a cool Valentine’s day Mailbox Suitcase to hold your classmate’s Valentines Day Cards. There is a slot to place your friend’s cards…and when you want to retrieve your cards, all you have to do is unbutton the suitcase straps and get them out. You can then use this suitcase as a treasure chest or storage container. Making Winged Hearts Valentines Day Cards with Paper Folding and Cutting - I made this heart with wings accidentally today so I thought that I would share with you how I made it. You start out doing a bit of paper folding and origami and then you start cutting a bit….what you turn up with is a valentines day card heart with wings. You can give this to somebody that you love on Valentines day. How to Make Valentines Day Mailbox Backpack with a Cereal Box - This is a unique Valentine’s Day Mailbox crafts idea, but I think all of your friends will ooh and aah over it. It is made from a cereal box and ribbons, amongst other crafts materials. AND you can really use it as a backpack, it really works. Have fun. Instructions for Another Origami Hearts - This is a second, more advanced origami hearts to make for Valentine's Day. Make a Playing Cards Love Book - This is a book that you make from a deck of playing cards. Tell the person you love the 52 reasons why you do love them. Awesome. Make a Laced Heart Shaped Book - Fill a Heart Shaped Book with The So Many Reasons Why You Love Your Special-Someone. How to make a Valentine Gift Box with a Bear Heart Brooch Pin - This is a cute and easy to do, Valentine’s Day gift that kids can make for their parents, grandparents, or close friends. This arts and crafts lesson is in 2 parts. In this arts and crafts tutorial, we will show you how to make a Teddy Bear Heart Brooch Pin. How to Make a Valentine Gift Box with a Bear Heart Brooch Pin Case Craft - First we made a Teddy Bear Heart Brooch Pin craft. 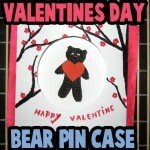 Now we will make this jewelry case to hold this adorable Valentine’s Day Bear Heart Brooch Pin. Magic Heart Trick Making Craft for Friends on Valentines Day - This is a really cool idea for a Valentines Day gift to your friends. This is a Wire Heart and Horseshoe Puzzle Trick … your friend or loved one will need to try to figure out how to get the heart off of the horseshoe. It is a LOT of fun. Valentine's Day Chocolate Bar Wrapper Craft - Give your special friend or loved ones a beautifully wrapped chocolate bar for Valentine's Day. Be My Valentine Stuffed Owls - Make these adorable stuffed owls with the following easy to follow sewing instructions. The heart in the center of the Owl's stomach says 'Be My Valentine'...give this to someone you love. Valentine's Day Decorative Candy Boxes - If you have ribbon and cardboard / card stock lying around the house, how about making handy dandy, beautiful, candy boxes. Fill the box with candy and give it to someone that you love. How to Make Magically Appearing Name Valentines Day Cards Craft - Today, we will show you how to make this really cool Valentine’s Day Card craft for kids. This is a really cool card that will show the name of your friend’s name or loved one’s name when moving the heart’s arrow. Learn how to make it on the following tutorial page. How to Make a Heart Bookmark - Learn how to make this foldable heart bookmark...it turns out looking amazing. Make Doily Valentine's Day Baskets - Make a Doily Flower Basket...the flowers are hearts. The basket is made from a doily and a ribbon. Valentine's Day Lollipop Flower Craft - Give your special friend or loved one a lollipop shaped like a flower. How to Make a Valentines Day Hearts Gift or Chocolates Box Craft - Learn how to make this Valentine’s day Hearts-covered Treat box. Put treats such as chocolates or candy hearts inside this box to give to somebody sweet. Just find the template that you want below. Then fold box together and paste. Then pull the heart fastening through slit in cover to close box. Valentine's Day Heart Shaped Fun Guy - Give your loved ones or friends a silly heart-shaped guy to show them that you care. Making Cute US Mailbox with Heart Letter Valentines Day Cards - Learn how to make this adorable mailbox with inserted Valentine’s Day heart and tag. Your friends and family members will think you are so sweet and creative to give this to them. The printable paper template can be found below, a well as directions. Have fun and send the love. Dangling Hearts Valentines Day Decorations - I’m going to show you how to make a Kissing Dangle Decoration for Valentine’s Day. It’s an easy craft, but turns out really beautiful to hang up for Valentines Day. Make a Heart Filled Vase of Heart Flowers - Use Corrugated Cardboard, pipe cleaners, paper, and a few other things to make your honey this cool heart vase. Valentine's Day Heart-Shaped Petals Flower Making - Make a beautiful flower out of many cute hearts. Making Heart Critters for a Valentine's Day Gift - Learn how to make a cute Valentine's Day Heart Person that is Holding a piece of Candy. Valentine's Day Card Mailbox (Coffee Can) to Make- Make a Valentine's Day Card Mailbox for your Class's Valentine's Day Party. Valentine's Day Puffy Card Tissue Paper Instructions - Make Puffy looking Valentine's Day Card for your loved ones or special friends. Valentine's Day Heart and Arrow with Peas - Learn how to make this neat Valentine's heart made wtih peas and toothpicks. Beautiful Folded Magazine Page Hearts - Have any magazines that you don't need anymore, recycle / upcycle the magazines into beautiful hanging hearts...we will show you how to do this. Valentines Day Books of Love - Make this cool book of secrets and then open it up on Valentine's Day to find out how much everyone loves you. Cool idea. Making a Greeting Card Display Wall Hanger Crafts Idea for Kids - Valentine’s Day is coming up soon, how about learning how to make this Greeting Cards Display Craft. You can hang it on a picture hook, or hang it from other high places. Then you can look at the love that people sent to you in Valentine’s Day cards, Christmas cards, Birthday cards, or whatever. Give Her a Valentine's Day Chocker Necklace - The girl or woman in your life will love getting this lace choker necklace for Valentine's Day. Learn how to make it here. How to Make Stained Glass Valentines Day Heart Window Hanging - Today we will show you how to make a faux (fake) stained glass window heart. It is so easy that I bet if you try one, you won’t want to stop. When you tape these on your window, the beautiful sun shines through them and they look so beautiful. This is a wonderful decoration to celebrate the ones you love for Valentine’s Day. Heart Stamps Making - Make your own heart stamps to make it easier to make all of your Valentine's Day Cards and Decorations. Making Valentine’s Day Hearts Candy Doggy Card Project - If you want to make a special Valentine’s Day Card Treat to give out to your friends and classmates this year at school, then here is a tasty and inexpensive project to make. It is a Tootsie Roll, Standing Hearts Doggy Card. The easy to follow, illustrated steps can be found below. How to Make Pretty Earrings or Ear studs Hearts for Valentines Day - Learn how to make these adorable polymer clay stud hearts (aka heart earrings). You can give these stud hearts to your Mom, Grandma, friends, etc to show them how much you care about them…especially for Valentine’s Day, Mother’s day, or a birthday. How to Make a Polymer Clay Heart Keychain Crafts - We will show you how to make this cool polymer clay heart keychain…a perfect gift to give to somebody you love or a good friend on Valentine’s day or to Mom on Mother’s Day or for a birthday. This polymer clay key chain is a cute heart adorned with flowers … perfect to decorate your phone, backpack, purse, etc. Laced Valentine's Day Cards - Learn how to make Laced Valentine's Day Cards and Hearts. Paper Doily Heart Boxes - Make this nifty paper doily heart boxes to hold all of your Valentine's Day cards in as a keepsake or for your classroom party. Make Personalized Chocolate Bar Wrappers - Make your sweetheart a special candy bar wrapper and give it to them on Valentine's Day. How to Make Fish from a Heart Box - Use your old Chocolate Heart Box from Valentine's Day and make an adorable cartoon fish from it. Cat Boxes Made with Chocolate Heart Boxes - Use your old Chocolate Heart Box from Valentine's Day and make an adorable cartoon cat with it. Make a Lollipop Holder Craft - If your sweetie pie likes Lollipops, you can make them this Lollipop holder. Leather Valentine's Day Key Chains - This craft calls for leather or a faux leather material. It is to make a Valentine's Day Key Chain...great to give to a friend or somebody that you love. Making Paper Hearts and Arrows - Learn the basics of making a paper hearts with arrows through it picture. Make Heart Critters with Pencil Noses - Make these cute Valentine's Day Hearts Critters with Paper and a Pencil. Cute Hearts Hair Barrettes - Learn how to make this cute hearts barrette. A Gumdrop Garden - Make this sweet gumdrop garden for your mom for Mother's Day or her birthday. Beads of Paradise - This is a fun jewelry for children to make, wear and eat. Bubble Gum Bouquet - Follow this tutorial and learn how to make a floral (bubble gum) bouquet. Candy Jewelry - Find out how you can make candy jewelry from a shoe string licorice and any candy with holes in it. Candy Stick Vase - Find out how you can make a beautiful candy stick vase in a few simple steps. Candy Train Craft - Learn how children can make a simple candy train craft. Candy Train Ornament - Follow these instructions to make a train Christmas ornament from candy. Candy Valentine - Make a candy heart for your special Valentines using lifesaver candies. Edible Bangles - Find out how kids can make simple and yummy bangles using only jelly beans and thread. Edible Bracelet - Find out how kids can make an edible bracelet using o-shaped cereal, red licorice lace, and cereal straws. Edible Jewelry - Make cool fashionable and edible jewelry using dental floss and fruit loops. Edible Napkin Rings - Find out how to make these amazing edible napkin rings. Flower Lollipop - Find out how to make homemade flower lollipops using lifesavers, popsicle sticks and other materials. Lollipop Flowers - Make lollipop flowers for all your family and friends. Love Train - Learn how to make an edible love train for Valentine's Day. Rose Kisses Bouquet - Send your special Valentine this beautiful rose bouquet made from Hershey kisses. Strawberry Heart Fruit and Candy Dessert - Give someone special a strawberry heart fruit and candy dessert. Sugar Cookie Bouquet - Learn to make this delicious sugar cookie bouquet. Sweet Necklace or Bracelet Craft - This edible necklace or bracelet would make a great party craft for a girl's birthday party. Valentine Twig & Felt Arrows - Learn how to make these Valentine's Day Cupid arrows with felt and twigs from your backyard. Valentine Pretzels - Find out how you can make homemade Valentine heart pretzels. Valentine’s Hearts made of candy - Make a homemade Valentine’s heart made of candy for someone special.